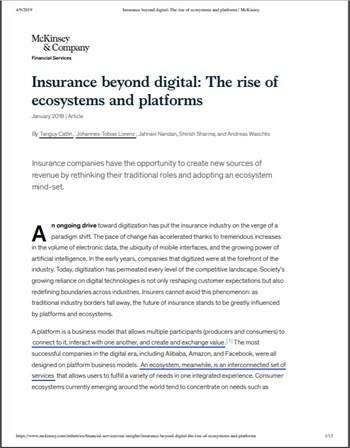 The consulting giant has turned its hand to the insurance sector to assess the current and potential impact of fintech disruption in their report: “Insurance beyond digital: The rise of ecosystems and platforms“. It highlights the lessons that can be learnt from comparative sectors on revamping their business models and tracks the potential journey from traditional offerings to inclusive ecosystems. McKinsey notes that the latest emerging economic powerhouses (incl. Facebook, Amazon, Tencent, Alibaba, Google etc.) have harnessed platform and ecosystem business models recently made available by developments in technology (AI, data services and aggregation) as well as culture (mobile and digital adoption). Platforms focus on matching multiple producers and consumers such as AirBnB, whereas ecosystems create an interconnected set of services.